"The Vaughn family had been with the Christian Church since the 1800s, probably because Father's grandfather, George Hand, had been a minister and missionary to the West from his early years with Alexander Campbell. . . . The Entiat Christian Church was pioneered by William Cannon, Sr. around 1900." "The Christian Church was built in 1902. C. A. Harris supervised the construction, J. G. Vaughn did the plaster work and P. M. Martin built the chimney." Neither the church nor the church planter are mentioned by Orval Peterson in his book on the history of the Disciples in Washington State. It is possible that the congregation was not affiliated with the Disciples of Christ, but was a totally independent congregation. 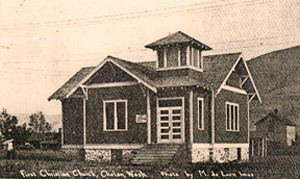 The Chelan church was organized in 1909 by W. T. Adams, with thirty members. In 1910 lots were purchased, but due to the removal from the community of a large number of members, services were discontinued until January, 1912. At that time, evangelistic meetings were conducted by S. L. Jackson, and the church was strengthened by new members. Victor Hovis (Hoven?) was called as minister. During his pastorate of one and one-half years, the men of the church cut logs and sawed them into lumber for the church building. The building referred to by Peterson was located on Wapato Street, one lot east of its intersection with S. Emerson Street. The DeMoss Hotel was on the SE corner of the intersection and the Christian Church building was on the east side of the hotel.